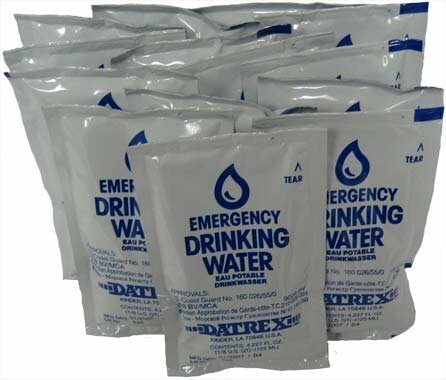 With a 5 year shelf life to match our Rations, our Emergency water packets provide a full meals hydration to one individual and are purchasable by the case of 64 or by the three-day supply (12 packets). Balanced with our rations to provide adequate hydration without over-burdening a carrier in case movement during a disaster is required, our Emergency Drinking Water is Coast Guard approved as sanitary and safe, unlike bottled water which is subject to absolutely no federal standards. Tough packaging stands up to weather and shields water against inhospitable conditions. Available for purchase by the 3-day pack or by the case. Case contains 12 individual water packets, to be consumed with meals, one packet four times a day. Shelf life: 5 years.